Without a doubt, 2018 was a year to remember for the fintech industry. Venture capital companies invested billions of dollars into this sector, hoping that they can a solid gain market share from the variety of financial institutions with their offers of modern digital financial services. So let’s start with the main number: in 2018, companies in the financial technology sector around the world attracted $39.57 billion in venture capital investments. This number is 120% more than in the previous year, according to CB Insights research. In 2017, 1.480 investment transactions were concluded, and in 2018 their number increased to 1.707. The amount of raised funds is that massive thanks to 52 megarounds (the ones that are larger than $100 million) as they accounted for $24.88 billion. 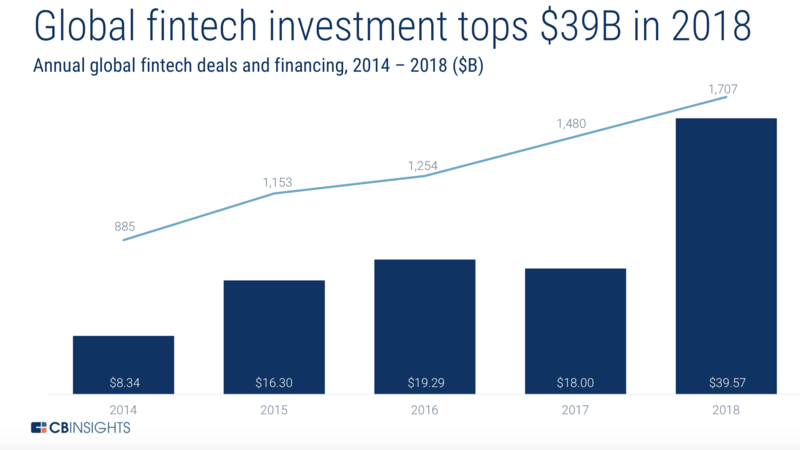 The fintech industry is getting large globally with deals outside of core markets (the USA, the United Kingdom, and China) which have accounted for 39% of deals. The American market is still the global leader with 659 investments accounting for $11.89B funding, which represents a new annual record. As for now, there are 39 VC-backed fintech unicorns worth a combined $147.37B. 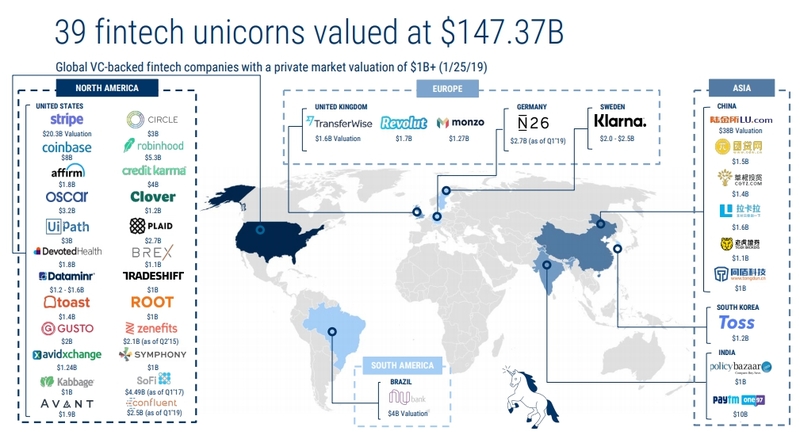 In the last three months of 2018, five new unicorns – companies with more than $1 billion valuation – appeared on the global fintech map. The most interesting names among them include the credit card startup Brex, the digital bank Monzo and the data aggregator Plaid. Besides, fintech analysts say that new startups have appeared in all areas of the fintech industry, including lending, banking and capital management. The largest jump in the number of investments in 2018 was observed in Asia: an increase of 38% as the volume of investments reached a record $22.65 billion. In the US, finance-oriented startups collected the historical maximum of $11.89 billion through 659 transactions. In Europe, however, their number decreased, but the amount of funds raised also reached a record of $3.53 billion anyway. The legitimate question arises: what’s in store for the fintech community in 2019? Key findings from the report indicate that that fintech won’t cease its growth. As we witness the industry progress, it’s fair to say that more technologies (as artificial intelligence) will emerge on the global fintech scene. So…will 2019 be even more groundbreaking than 2018? There are strong suspicions that it will.